Beguiling, aromatic memoirs of a cookery writer, settling in a small Normandy town, very similar in flavour to Under the Tuscan Sun. The second house that Susan Hermann Loomis looked at in the small town of Louviers was perfect. Dilapidated, rambling, crumbling walls which were covered with faded paper, it had been a convent. So Susan, her husband, luckily a sculptor and builder, and small son, moved in - to spend a year and more, rebuilding, finding new hidden treasures of their house, and discovering their neighbours, and the life of a small French town. Some of the great pleasures of the book come from sharing in Susan Loomis' daily journeys: to the market, to the butcher and the baker, talking to the shop keepers and the teachers at the school, and meeting the clergy who tramp through their garden. 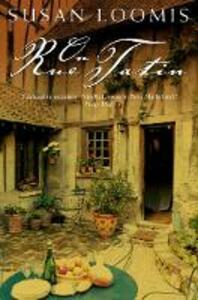 As her son joins the local school, as Susan's cookery work gets underway, so the reader is part of all the human - and gastronomic - experiences that shape this very French town.